What to most of us would seem to be an obvious conclusion, the United States Seventh Circuit Court of Appeals confirmed that if you try to move rolls of insulation in a self-service area, and notice that a stack of insulation is leaning, don’t expect to recover damages if the stack of insulation later falls on you. In Dunn v. Menard, Inc. No. 17-1810 (7th Cir. ), decided in January 29, 2018, the Seventh Circuit affirmed a District Court’s grant of summary judgment finding that Menards did not owe the plaintiff a legal duty of care. The underlying facts to the case are relatively simple. Mr. Dunn and his adult son purchased 21 rolls of fiberglass insulation inside the main store portion of Menards. After completing the transaction, a cashier told Dunn to go to one of Menards self-service warehouses to pick up the rolls. At the warehouse, a security guard directed him to the insulation. Posted at the entrance was a sign which said: “For your safety, caution, do not open packages, do not pull, do not climb, and if you need assistance, please call.” Dunn saw no Menards employees, but did not call for assistance. Instead, Dunn and his son decided to load rolls of insulation into their van by themselves. They did notice that one stack of insulation, approximately 16 feet in height, was not straight but leaning to the right. Although Dunn and his son claimed not to have touched the leaning stack during loading, the stack fell knocking Dunn to the floor and injuring his right shoulder. After discovery, Menards moved for summary judgment on the grounds that the danger of the stack falling was open and obvious, and it did not owe plaintiff a legal duty. In opposing the motion for summary judgment, Dunn tried to argue that there were “different opinions and interpretations” as to how the leaning stack appeared, and so created an issue of fact. The Seventh Circuit, however, would have none of that. It held there was undisputed testimony that the stack was “unstable” and that it was “obvious.” The Court rejected Dunn’s argument that, while he saw the condition, he did not fully appreciate its risk. 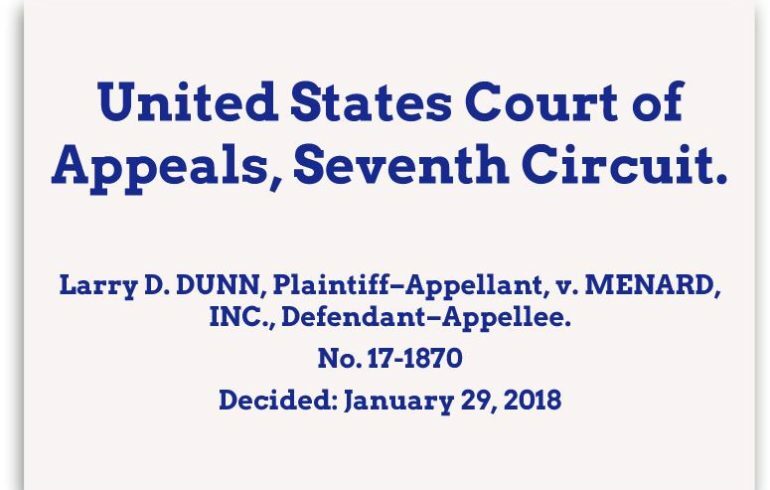 The Seventh Circuit stated that it does not matter what the plaintiff actually thought or may have appreciated, rather what a reasonable person with knowledge would have done under the circumstances. The Appellate Court also rejected the argument that the landowner should have anticipated that the plaintiff would have deliberately encountered the situation. The Court said that such an exception did not apply since other options (including asking for help) were available to Dunn. Additionally, the mere fact of looking elsewhere did not constitute a distraction such as to preclude the application of the application and open and obvious doctrine. The Court also rejected the notion that Menards had a legal duty to constantly patrol its self-serve warehouse to prevent customers from injuring themselves. The lack of continuous surveillance did not create a legal duty to the plaintiff and the Appellate Court said it would not impose such a duty as a matter of law. What is the takeaway? Plaintiff shoppers are obligated to look out for themselves, and cannot willingly encounter a danger, and then claim the store owner should have prevented the danger.